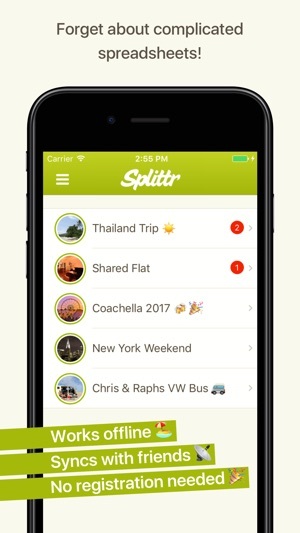 Splittr helps you to split group expenses on vacations, with your roommates or any other group activity. 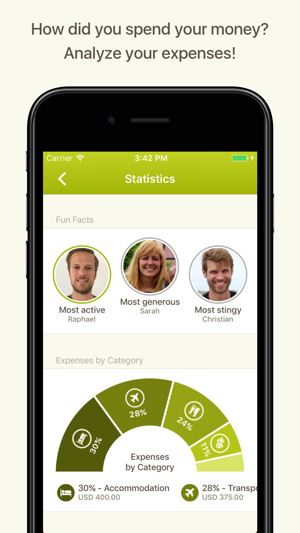 Invite your friends and everybody can enter expenses with their own devices. 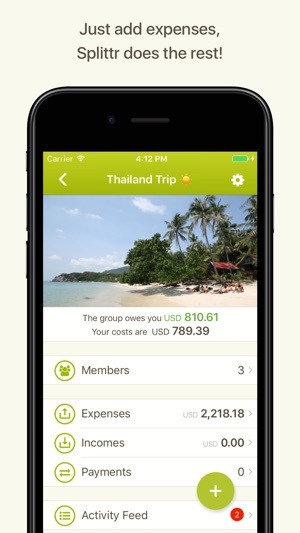 Use case: Imagine you are on a trip with two friends: Emma and Daniel. You pay $100 for gas for the trip. Anyone with a calculator can divide that price three ways, but even then, you’d normally have to keep a record of the expense in order to divvy it up later. 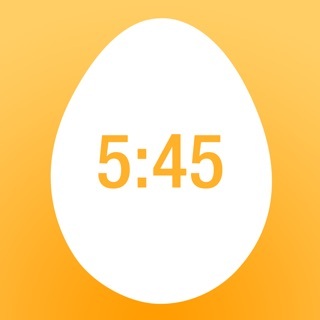 With Splittr, this expense is entered in a couple of seconds and divided equally with little time or effort. Imagine that later, you, Emma and Daniel go to a restaurant. You’re not hungry, so you only order juice. Daniel orders a steak and a cheesecake. Emma gets a spinach salad. The bill is $80. Daniel forgot his wallet in the hotel room and doesn’t pay, but you chip in $60 and Emma pays $20. You need a math degree to calculate who owes what, right? Not with Splittr! Simply enter who paid how much and Splittr will do the rest. - You can now zoom and scroll expense images. - We reduced the inserts of interstitial ads to make the app a little more user friendly (concerns non premium members only). 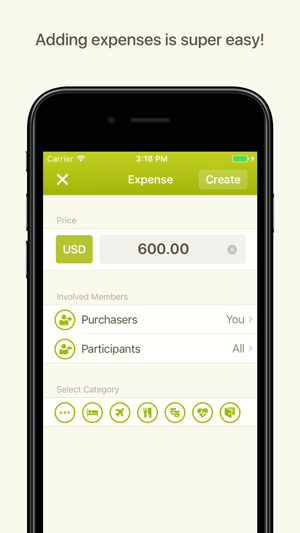 - You can now define which participants should be preselected in an expense. Simply tap on the lock icon to save the currently selected participants as default. This is helpful when a member leaves early which should stay in the group but should not be preselected as a participant in future expenses. - The activity list can now be scrolled down again. - We fixed the CSV export. A column was shifted. - And many small bug fixes and improvements. Thank you for your great support, your great reviews and your emails that help us a lot improving Splittr for you! 17 days, 5 couples, 3 countries, 3 currencies, $7,500 in shared expenses and creative expense splitting throughout. Splittr made the finances of this trip between friends SOOOOO simple. I’ve had trips with 2-3 friends over a weekend or so and used a spreadsheet to track it all. But before going on this trip, I knew I needed something more as my spreadsheet became unwieldy when you had to split things unevenly and/or had to exclude different people for different expenses. Not to mention multiple currencies. Splittr handled it all with ease. It can split expenses by $, %, evenly, a weighting, or any combination of these. I merely took a picture of the receipt when an expense was incurred and either entered it on the spot into Splittr (took well less than a minute even with the OCD double checking I do), or that night. 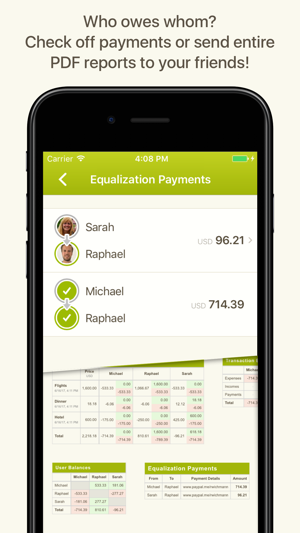 It gives a complete report of each expense by person/couple showing what each paid and was allocated for the expense. So complete transparency for all. Also figures out the most expedient way to settle up to minimize transactions between parties. Can’t say enough good things about this app. We travel often with friends. In the old days before Splittr we would write down every expense and who paid for what. It was painful to settle up at the end of the journey, and we probably made a lot of mistakes. We read about Splittr in a news article when it was quite new and have been enthusiastic users ever since. Early on there were a few things the app couldn’t do for us, and I corresponded with Raphael. He was so receptive to the feedback, and the app now has all the features we need. I keep the “books” on Splittr when we travel, but the whole group loves the app as much as I do. Love being able to email everyone a statement at the end of the trip so everyone can check everything over. It’s truly a great, great app. I have used this app a number of times over the past couple of years. Last time was a few months ago. We just started a trip and we’re surprised to find out that the current version is much less intuitive than previously. This is a trap app developers get into: Keep throwing requirements in and a previously simple and graceful app that did one thing well now does many things-poorly. To be clear, this used to be simple and intuitive and is now inscrutable. Clearly little or no user involvement before release.